The Hebron office of the Palestinian Prisoners’ Society (PPS) said several army vehicles invaded Bani Neim town, east of Hebron, and abducted Eid Sobeh Tarayra, 47, after violently searching his home, causing damage. Eid is the father of Issa Tarayra, 16, who, on September 20, 2016, was killed by Israeli army fire near Bani Neim town, after the soldiers claimed he “attempted to stab them, while eyewitness said the child was shot right after he stepped out of a Taxi that was stopped by the soldiers. In addition, the soldiers invaded Sho’ab as-Saber area, near Karmie Tzur illegal colony, built on Palestinian lands, southwest of Beit Ummar town, north of Hebron, and searched homes, before abducted a Palestinian, identified as Rabea’ Mohammad Awad, 21. 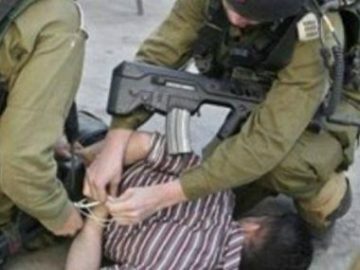 Mohammad Awad, the media coordinator of the Popular Committee in Beit Ummar, said the soldiers abducted his son from his home, and moved him to Etzion military base and detention center, north of Hebron. He added that the abduction of his son brings the number of Palestinians from Beit Ummar, who have been abducted by the army this year, to 38. It is worth mentioning that the soldiers installed roadblocks on roads leading to Sa’ir and Halhoul towns, and Hebron’s northern entrance, before stopping and searching dozens of cars, while inspecting the ID cards of the passengers, and interrogating many of them.